We have a new article revisiting the topic of my PhD thesis, but with a twist. 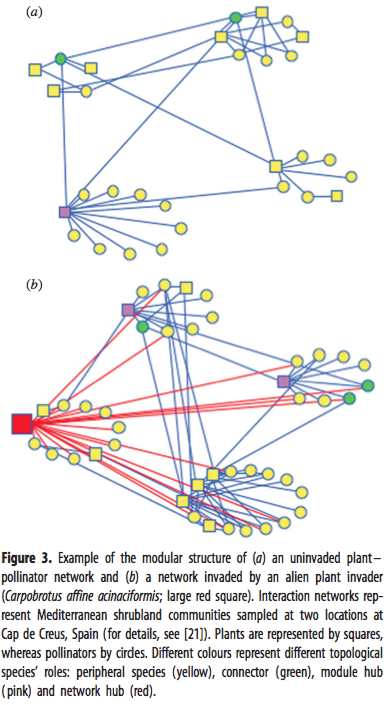 Invasive plants effects on network modularity. Back then I already explored a bit the effects of invasive plants on the modular structure of the plant-pollinator community, but I never published any result, among other things because I didn’t understand well what I was doing. That’s why when Matthias asked me to join his paper addressing this question with a bigger dataset I was very happy to give it a second try. Now (6 years later!) I understand two key things way better. First, that invasive plants have different roles in the network than natives, not because they are not native, but because of its different characteristics (i.e. very abundant and generalized). Second, that it is more interesting to understand how the roles that different species play within the network change, than how the overall network structure change, mainly because very different networks can present very similar structures (i.e. nested and modular). I think we nicely present this two points in the paper. See the figure below, and read the paper if you a curious about knowing more. A friend of mine recommended me to read Valverde’s autobiography, both because I am moving to the Doñana Biological Station, of which he was the main advocate, and because the book is really awesome. In fact, he writes really well and the book is full of fun stories and subtle puns (not sure if it’s translated to english, though). Valverde, as I see him after reading the books, is the perfect blend between the traditional English naturalist and the Spanish picaresque. He had a pretty rough childhood including a pretty bad tuberculosis in the midst of the spanish civil war. With no official studies he learnt ecology the hard way by reading whatever book he can find and collecting observations of the fauna around his home town. While reading it I really regretted not being a better naturalist myself and now I really want to get out of my computer and just look at nature for a while. He also had a great ego (which is see as a positive thing). As an example, I love when after years of collecting observations on bird communities around his home town, he reads Elton influential book and says something like he didn’t learnt anything new in Elton’s that he had not discovered himself before, but that the book was very good to put names to familiar concepts. And I believe that is true and not arrogance. How Doñana Biological Station was created is also quite epic, and i didn’t know that they (WWF, among others) actually bought the lands to create the reserve. Really if there is a will, there is a way. However, is quite astonishing also to see its actual destruction despite the conservation efforts. But read it, is long but easy to read (start for volumes I and IV), and you will get a glimpse of how ecology developed in Spain* since the 1930’s. * in Valverde’s words, the two main revolutions in the field of ecology in Spain were the Peterson bird guide and the SEAT 600 car; the first allow anyone to identify birds effortless, and the second to travel around.